Starting a BSc Psychology at LSBU, he was keen to make the most of his placements – which can be a great platform for graduates to find work. "I realised that to have any kind of start in a career in Psychology that effective work experience is regarded as equally important as a good degree mark." So when Chad was offered a placement through LSBU's Psychology faculty as an honorary assistant psychologist at the National Psychosis Unit, he jumped at the chance. The National Psychosis Unit is attached to Kings College and the prestigious Institute of Psychiatry. For those aspiring to work in psychology, being placed there is an excellent opportunity to gain insight, experience and contacts that can be invaluable after graduation. The placement involved working with adults experiencing psychosis who had been, up to that point, treatment resistant. Many of these service-users had other diagnoses such as bipolar disorder, schizophrenia, anxiety disorders and schizoaffective disorders. "It was a fantastic experience, meeting and becoming friendly with people who were essentially, typical people but with mental health difficulties. The relationship that developed was exceedingly rewarding and clear-cut evidence of the importance of rapport and empathy, which is difficult to teach." 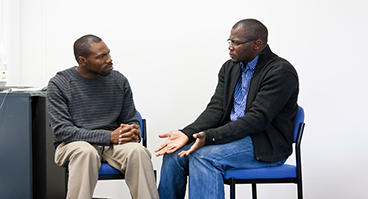 Chad received advice and support from a clinical psychologist, guiding him in the placement and helping him gain a more thorough understanding of how clinical psychology is implemented within the NHS. "I learnt a lot from working with other volunteers from different institutions who were at different stages of their psychology career such as Masters and PhD students. I also had rich experience sitting in ward rounds and multi-disciplinary client review meetings with Psychiatrists, Psychologists, Nurses, Social Workers, and even being asked to contribute to discussion about service-users' recent progress." The main duties for Chad involved running activity groups that allowed the service-users to try new things, confront fears, and stimulate social interaction. "This often helped them, at these times, to become less distracted by their intrusive thoughts and other worries." Other duties also included one-to-one time with clients, administering psychological self-report scales, encouraging them to set goals, and even supporting them with their therapy homework. "The whole experience was rich and rewarding and has been pivotal for me in getting other psychology related work and research since graduating."